How much is a local caddie worth after a victorious weekend? Each week, senior writer Alan Shipnuck answers your questions on anything and everything golf in his mailbag. This week, we've got plenty of caddie questions... As a journalist, do you accept, “That isn’t a story” as the final answer on the Kuchar thing? [email protected] Of course not. It’s not the perogative of the athlete — or politician or any other newsworthy figure — to tell a reporter when and how to do his job. If I had been at the Sony I would have pushed Kuchar hard for all of the specifics. The problem with this particular controversy is that the sourcing was and remains shaky: a couple of tweets by a fringe professional golfer who didn’t specify exactly where the information came from quickly led to others passing on various innuendo and stuff they had “heard” through the years, and in the space of a couple of hours Kuchar was tried and convicted in abstentia on Twitter. Of course, he didn’t help himself by offering a non-denial denial when finally confronted by reporters. I hope Tucan will emerge and tell the world exactly what he was paid so we can render a verdict on the fairness of this electronic mob justice and give closure to the grad students who are surely now writing theses on this oddly compelling situation. 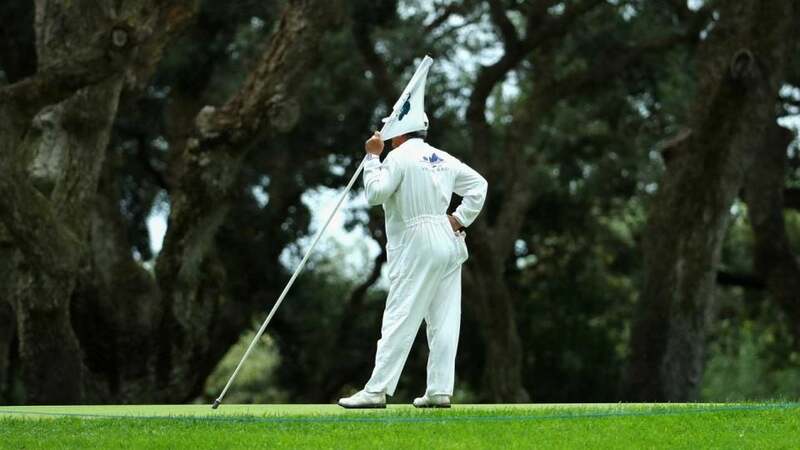 #AskAlan What would you pay an amateur caddie if you won a PGA event? -Paul @GolfFoodAddict So this Kuchar-Tucan controversy took on a life of its own. Over the weekend I texted Kooch and called a couple of different spots in Mexico trying to reach the principals but didn’t hear back from either the player or his allegedly aggrieved caddie. In the absence of hard information about this particular situation, I went another route, speaking with four PGA Tour regulars who have each won multiple tournaments. I granted them anonymity so they would speak candidly. All four said that they would not pay 10% of a winner’s check to a fill-in caddie; one of the players said that currently he only pays his full-time caddie 8% of a victory. All four Tour vets echoed a point that Brandel Chamblee tried to make on Twitter: players pay out so much on a victory - $130K or more for four days of work – partly to make whole their regular caddies for all of the missed cuts when they don’t earn a dime. The reasoning follows that since a fill-in caddie hasn’t endured all the suffering they don’t deserve the bloated spoils, either. So what’s a fair number in the Kuchar-Tucan scenario? The players I spoke to offered these bonus numbers: $10K, $25K, $40K and 5%, which would work out to $65K. But we waded into murkier waters when three of the four players mentioned the low cost of living in Mexico, seemingly as an excuse to be stingier. So does that mean they’d pay an American temporary caddie who lives in the U.S. more money for a victory? One of the players – who is top 100 all-time in Tour earnings – let out a hard little laugh and said,”Let’s not get carried away, okay?” Given recent rumors/incidents, do caddies/players on the Tour have a printed/signed enforceable contract that they use, or is it all "handshake agreements"? [email protected] I have heard of a couple of superstars having their agent draw up a contract with the caddie, specifying terms, but otherwise it is almost entirely a verbal contract, which is kind of cool and old-school but obviously invites all kinds of problems. We have to feel good about the Shrimp in his 2019 debut - what does his schedule look like and how does it set up for his success? [email protected] Yes, going back to the Fall Series, Camarón has now made 4 of 6 cuts, which is a solid start, but he’s just treaded water on the weekend and finished no better than 41st. He’s already in the field this week at the Hope and for Pebble and will likely get into Phoenix, as well. The Clambake and the Hope offer good venues for Camarón because he’s a precision player and those are shortish, finesse courses. At the end of the West Coast swing there will be a reshuffle for the Web.com graduates to determine the order of priority for the Florida events. Right now Camarón is 29th on the list, which isn’t great. He needs some strong finishes to move up the list so he can gain entry into more tournaments, though in any scenario he should get into the upcoming opposite events in Puerto Rico and the Dominican Republic. Given his many victories in Canada, Mexico and throughout Latin America, it’s clear that Camarón’s game travels. Now that he’s getting settled in, and with the outpouring of support he should receive from the galleries going forward, I’m optimistic he’ll give us more to cheer for. Has another multiple major winner ever become more unlikable faster than Jordan Spieth? [email protected] Brooks? (Cough, cough.) It never fails to interest me how much interest there is in Spieth. He is certainly polarizing, but that’s a good thing – far better to have the golf populace love and hate you in equal measure than to arouse no feelings at all. I can certainly understand why fans are put-off by Jordan’s on-course demeanor, which can come across as whiny and sullen. But I love the fire he has inside and he can be an engaging interview – guarded, yes, but also very smart and analytical. I don’t think he’s unlikeable but can certainly understand where you’re coming from. Jordan Spieth's putter has him in trouble, but how long will it last? The yips have been known to derail careers. Is Jordan Spieth in trouble? #AskAlan -Clay (@FlintHaven) One so-so week in Hawaii is not much of a sample size. But I agree that Spieth’s putting will be a big focus of this season…which is not going to help his putting. It’s such a black art, and so mental, that having to dissect his yips or non-yips after every round is going to weigh heavily on Spieth. How much are you looking forward to listening to Padraig over the next 18+ months ruminate on the psychology which underpins a Ryder Cup captain's role? [email protected] Immensely! He always been one of my favorite interviews. I’ll never forget the first time I encountered his beautiful mind, at, strangely, the 2000 Portugal Masters. He was brought into the press tent as one of the leaders and a random Portuguese reporter asked Paddy about a short putt he had missed on the back nine, noting that he seemed to take more time standing over the ball. Harrington gave a brief answer to the insightful question but after the presser he buttonholed the scribe and asked him questions for at least 10 minutes about what he had observed and any other impressions he had of Harrington’s game. It was fascinating theater. And of course in the two decades that have followed Padraig continues to plumb the depths of his psyche like no other golfer. His deep reflections about the exquisite torture of Ryder Cup pressure (and everything else) will be quite a treat in the coming months. Do you expect Augusta National to allow the pin to be left in while players are putting on the greens? Or will we have golf’s equivalent of a Constitutional Crisis between ANGC and the USGA? #AskAlan [email protected]_Feiler At this moment, the USGA has not allowed for a local rule regarding the pin situation. That could change, or Augusta could go outside the Rules of Golf and simply issue their own decree, which would be somewhat hokey but, hey, those good ol’ boys have long done whatever they please. But newish chairman Fred Ridley is a traditionalist who spent years as part of the USGA firmament and no doubt he doesn’t want his second tournament at the helm to be overshadowed by yet another rules kerfuffle. All this said, I think the pins will be in at the Masters, which could be a big help on some of those frighteningly fast downhill putts. To speed play for non-tournament amateur rounds, all groups should agree on the 1st tee that, unless the wind is blowing them sideways, no flagsticks will be removed that day. No questioning everyone on every green. It’s staying in. Period. Thoughts? -Matt (@M_Sand09) What is this, North Korea? Our founding fathers (this includes Mike Davis) have granted us certain liberties, and this includes not having some jabroni tell me what to do with the flagstick on the first tee. Now, I agree that a little communication is necessary at times, but imposing your putt-related values on the entire group is going to create a lot of friction, to say nothing of the the coefficent of restitution. Were the USGA and R&A both drunk when they came up with the idea to drop from knee height? The disparity between, say, Mark Leishman and Brian Harman should be taken into consideration. [email protected] But didn’t that same disparity exist at shoulder height, too? I agree it’s an awkward rule but I don’t think the difference between being 5’6” and 6’3” is a big deal when it comes to taking a drop. Since its inception, you can pick any year to tee it up in the Clambake. What year do you choose? Anything other than 1956 is clearly the wrong answer. [email protected] Yes, it would have been fun to cruise down 17 Mile Drive and spectate at The Match back in ‘56. But the Hogan win in ’49 would’ve been tasty to witness, or how about 1972, when Jack beat Johnny in a playoff. But as for teeing it up myself, I’d take pretty much any year before 1990, when Cypress Point was still part of the rota and social media didn’t exist so I wouldn’t have to suffer any online hazing. Played my first round of the year. New rules were entirely insignificant except... three minutes is not a very long time to look for a ball. Rather brutal, honestly. Playing a course with actual rough and no forecaddies - this feels almost unfair to amateurs. Thoughts? [email protected] Hard disagree. If you can’t find it in three minutes it’s either a really crappy shot or you’re massively unlucky. Either way, take your medicine and stop holding up the group behind you. I hate stomping around looking for wayward golf balls. It’s particularly dispiriting when it’s not your ball and you have to pretend to care about a playing partner. I’m all for shortening this torture. If you had no other choice, would you rather name your son “Injected Twist Face” or “Epic Flash”??? -BJ (@PowerFader769) Dude, I live on the California coast. My kids already go to school with boys named Ocean, Diesel, Skye, Briggadoon and various other exotica. I think Epic Flash Shipnuck sounds kinda dope! The Santa Ana and Kona winds are at the same party. Drinks are flowing, some intemperate remarks are made, things escalate and before you know it, they're throwing. Who do you like, straight-up? [email protected]_TireWorld I’ll take Indio, because everything breaks toward his fists.